For the past week, our local newspapers and television have been preoccupied with three main themes: feel-good features about Christmas, horror stories about murderous ex-husbands dressed like Santa Claus, and expanded coverage of multiple waves of bad weather (snow, fog, ice, snow, and ice-jammed flash flooding). 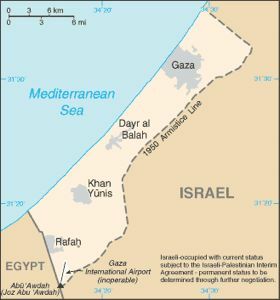 Pushed to the margins of the news (here, at least) has been the recent conflict between Israel and the Hamas-led Palestinian government in Gaza. Network news gives broad overviews, without any discussion of the conflict’s effect on normal, everyday people there. The Mideast Youth blog today features a podcast interview with Ramzi, a teacher living and working in Gaza. Ramzi is an occasional contributing writer to the site, and he offers a first-person account of what was happening there over the weekend. With no electricity, and access to food and medical supplies, the picture he paints is grim. The feed to subscribe to the Mideast Youth podcast is here.